WHEN Laurence Kitchin discussed the drama that he calls “compressionistic” because of its enclosed settings, limited characters, and claustrophobic atmosphere, he suggested that such drama had had its day in the live theater and that its natural home was television. The shift from theater to television, however, introduces two new problems: the medium and the audience; and the latter, at least, is remarkably difficult to evaluate. What is noteworthy is that Pinter, in writing for the apparently confined demands of television, has widened the scope of his plays. One reason for this expansion is that while the small screen seems admirably suited to a drama in one room in the way a larger theater often is not, the extreme mobility of the camera in television productions allows a greater use of sets or of half sets. The theater, which has to use the whole stage, is unable to restrict the audience’s vision to one corner by use of a camera. 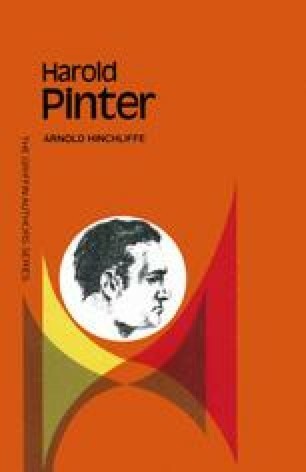 This mobility, reflected in the plays that Pinter has written for television, anticipates the even greater mobility he enjoys in his film work.